In this article we will discuss about double field revolving theory in induction motor. This theory is based on the factor that any pulsating quantity whether magnetic or electric quantity can be resolved into two anti parallel components. Say we have a magnetic flux having magnitude of Φm then this flux can be broken into two components say each having magnitude of Φm/2. Now the flux have two opposite direction and equal magnitude so the resultant flux i.e. stator flux will be of alternating nature and will be perpendicular to these flux components. Initially when the single phase induction motor is started, these two fluxes are equal in magnitude but opposite in direction and hence these will produce torque that will also be equal in magnitude and opposite in direction, so each torque tries to rotate the rotor in its own direction. Thus net torque experienced by the rotor is zero at starting of the 1 Φ Induction motor and it explains the fact that single phase induction motors are not self starting. To understand the torque developed in single phase induction motor, lets give both torques a name. Say torque in the direction in which single phase induction motor starts rotating is forward torque and its opposite torque is backward torque. It is clear from the above diagram that as speed increases +ve forward torque increases and backward torque becomes less negative and vice versa. 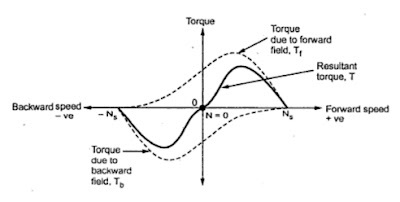 It is clear from diagram that an Speed=0, Forward torque is equal to backward torque and it gives zero net torque, which support the fact that single phase induction motor are not self starting.